The gardens are open to visitors every day from sunrise till sunset. There is no admission charge, but donations support garden projects and are appreciated. Metered parking is available near the UDairy Creamery, or visitors can obtain a parking pass for the Townsend Hall parking lot online. For technology savvy customers, the PassPort parking app can be used to pay for parking. Here are directions to UDBG. Accessibilty: UDBG’s paths are primarily mowed grass paths, with the exception of the paved path in the Herbaceous Garden. Restrooms are located in Townsend Hall which is open on weekdays or in the Fred Rust Ice Arena. 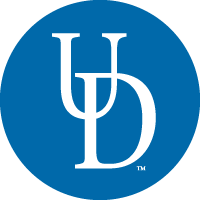 UD buildings are closed November 22-23 and December 24-January 1 and other national holidays. Weddings and Receptions: The College of Agriculture & Natural Resources does not permit weddings or receptions in the garden. Guided tours of the garden are available for groups of 10 or more. Our staff will work with you to provide a memorable experience, whether you are seeking to gain horticultural knowledge or want to appreciate the beauty and design of the gardens. Please call 302-831-2534 or use the Contact Us page to request a tour. The cost is $10/person for 25 or less (one guide); over 25 requires two guides and is $12/person. This does not include a UD parking fee.